Selling furniture is a good way to make extra money as a side business, and can also be profitable as a full time business. People are always in need of furniture, be it beds, sofas, chairs, or tables. Once you learn about furniture, and where to go to acquire various pieces and brand name items, the buying and selling part is routine. There are a few legal steps needed before the actual process of buying and selling can take place. 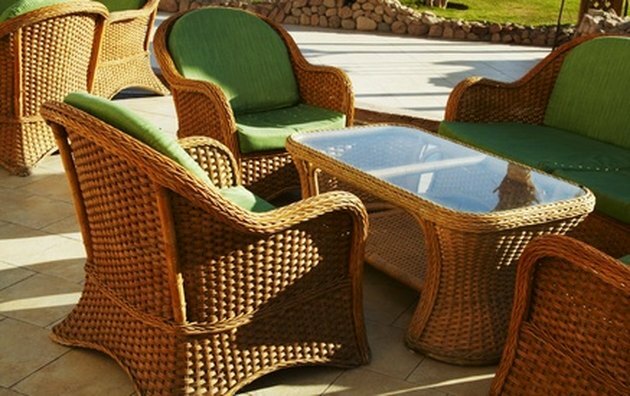 Wicker furniture bought and sold for resale. Acquire a business license and tax number. To be a professional furniture dealer, a license and tax number is often required to buy and sell furniture, as you will have to charge state and local tax. Use your tax number when shopping at second-hand stores or antique malls to get a discount. Often dealers receive a discount, or don't have to pay tax on furniture with a tax ID number, when buying for resale only. Go to a furniture trade show to acquire various furniture lines, and different types of furniture pieces. Have your license ready and up-to-date before attending a show, for proof will be required at the show that you are a licensed dealer. Dealers need their retail certificate number, federal ID number and contact information when inquiring about selling new brand name furniture for resale. Get a business permit if operating from a brick and mortar storefront. Selling furniture online may be different, but check with your city on restrictions about operating a resale furniture business from a home base. Purchase inventory. Decide what kind of furniture you want to sell. New furniture requires going to trade shows and buying from wholesalers. Start off with second-hand or antique furniture as you learn the selling process, for the prices will not be as expensive buying used furniture compared to newer pieces. Go to garage sales, second-hand stores, and antique fairs to look for antique furniture and used pieces. Learn how to reupholster, stain and repaint, and fix up second-hand furniture to resell. Keep a receipt of your purchases, and if no receipt is available, keep an accurate record of the items purchased, and what you spent. You will have to report your profits and earnings to the IRS during tax time per year. Go to manufacturers conferences and make connections. There might be a club or membership that you can join, and be privy to information about the best sales and shows, or gain insider access to fine furniture items.